A few weeks ago, Nikole Hannah-Jones produced a tour de force report on school segregation in America, which became a two-part episode on the public radio show This American Life. In the first part, she dove into the complex legal and racial geography of the St. Louis metro area, explaining how the imaginary lines of municipal and school district borders sort children who might otherwise think that they belonged to the same community into dramatically separate and unequal educational institutions. How is it that, more than sixty years after Brown v. Board of Education and generations after the Fair Housing Act, places like suburban St. Louis—and New York, and Austin, Texas, and cities around the country—maintain these boundaries between wealthy and disproportionately white “high-performing” schools and resource-starved and disproportionately black “underperforming” schools? Exclusionary zoning works two ways: first, by requiring that all homes be relatively large and luxurious; and two, by limiting the total number of homes, regardless of how much demand there is for housing in a given community. The effect of both measures is to increase home prices, and keep out anyone who can’t afford the inflated costs. Rothwell finds, right off the bat, that schools that perform well on standardized tests are both larger and much more costly than others. In the 100 largest metropolitan areas, homes near “top” schools have 1.5 more rooms than homes near “bottom” schools. They also cost over $200,000 more—which means a typical family would need to pay an additional $11,000 per year in mortgage costs to afford such a home. But, of course, people want their children to get a good education and are willing to pay for it. In economic terms, the value of good local schools gets “capitalized” into the price of housing: All else equal, a home in a good school district should command a higher price than an identical home in a worse school district just because of the value of that education. How do we know that this cost premium isn’t just a natural result of the intersection of the housing market and the varying quality of school districts? What Rothwell shows is that these gaps look very different from region to region, in a way that’s highly correlated with zoning practices. 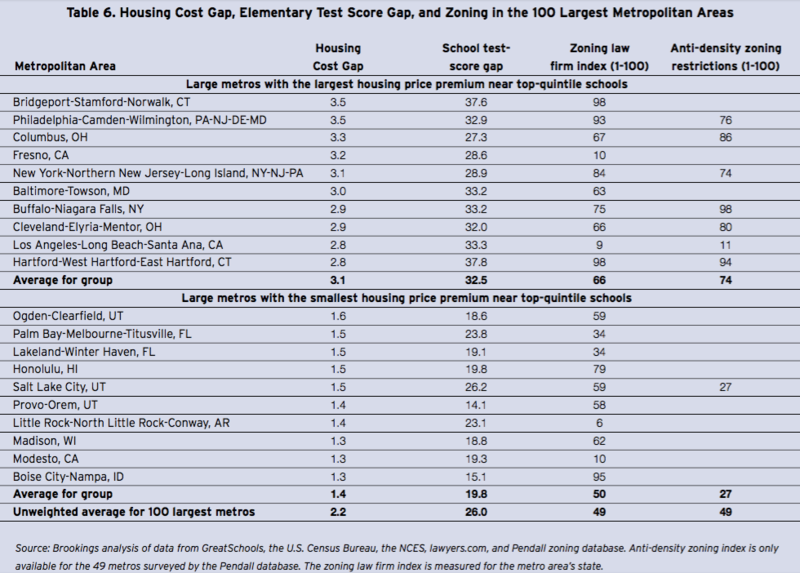 The home price differential between high-scoring schools and low-scoring schools is 40 to 63 percentage points greater in metropolitan areas with the most restrictive zoning, compared to those with the least restrictive zoning. That shaves tens of thousands of dollars off the average price of housing near high-scoring schools. And within metropolitan areas, tightly-zoned municipalities have home costs that are nearly $4,000 a year more expensive than the regional average. Those higher prices, in turn, foster segregation along the axes of income, race, and school quality. Cities and towns with high levels of exclusionary zoning have student bodies that are nearly 20 percentage points less Hispanic and black, and 17 percentage points less low-income, than their regions as a whole. Their elementary school test scores are also more than 16 percentage points higher. In the end, connecting the dots, Rothwell estimates that metropolitan areas with the tightest zoning (places like Boston or Buffalo) had developed under relatively open zoning (like Portland or San Diego), their test score gaps between low- and high-income students would be more than seven percentage points smaller. When it comes to issues of urban equity and opportunity—from crime to health to education—a good rule of thumb is that housing is in everything. And a good corollary is that if you scratch a housing issue, you’re likely to find a zoning issue. Rothwell’s paper, though a few years old, is a valuable contribution to our understanding that the same regulations that make traditional neighborhoods illegal are also contributing to school segregation, and the “education gap” between haves and have-nots.